How do reluctant writers respond to writing in the Blippit App Maker? For years we’ve kept the app writer as a completely open ended tool so that people aren’t immediately channeled in to predictable and boring pathways like trying to create a restaurant app. The result is has been that teachers are able to, for example, focus on their own curriculum subject areas like vikings to extend, consolidate and publish the children’s learning to the whole world with a literacy focus. Here’s a quick view of the apps once they were published to our App Store on Planet Blippit. We’ve been focusing on how the process of improving non-chronological report writing could combine with publishing a mobile app using Blippit’s App Maker. One of the most striking factors was the effect of telling the children that their app would be seen by the world; this would include mum & dad on their mobile phones too. We’ve always believed in the positive effect of having an authentic audience and what was clear was that these children, at such a young age, were highly motivated at the thought. What you’ll get a sense of in the video is the absolute focus on literacy and writing improvement. What was less easy to capture was the willingness of the children to ‘fix’ their writing to make it better. This is the ‘norm’ for these children it seems and dealing with being told that there’s ‘a problem with’ some part of their writing was not a problem for them. You can get the Viking App Template from Blippit Academy. Listen to Assistant Head & Literacy Leader Mrs Emma Smallshaw, from Salesbury Primary in Lancashire, in action with her class and reflecting afterwards about the process so far. You can also read and listen to Part 2 of this project and if you prefer YouTube you can catch the project playlist here. Say goodbye to a blank app project starting point! New features to support faster, smoother and easier lesson starts, assessment and collaborative working are now live for all schools. Save a great project starter app as a project template and share it out directly within Blippit to target year groups/classes or individuals for any subject or colleague to use. Teams of students working collaboratively can plan and develop an app project together then download the basic app and share an exact copy to each member of the team to develop different versions based on that design. This is done with the new app template upload/ download feature available to all users. 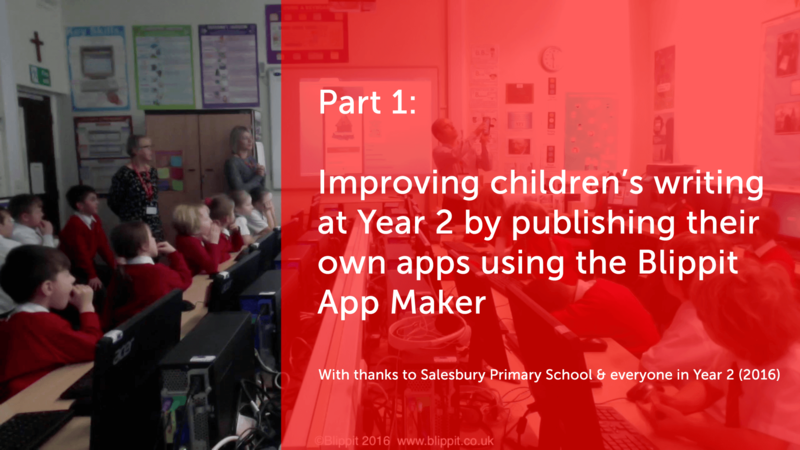 Here’s one video about how the teacher can now really easily share their own project in the app maker as a template for other children to work with and learn from. More videos on this topic are in the Blippit Knowledge Base. As you can see every app made by a student or teacher user now has an extra link so that others can download and remix the app if they want to using their own Blippit App Maker account. No other tool can open a Blippit App to remix and develop it further. All apps are teacher approved and all apps carry an audit trail in their About section to show the origins of the app project. 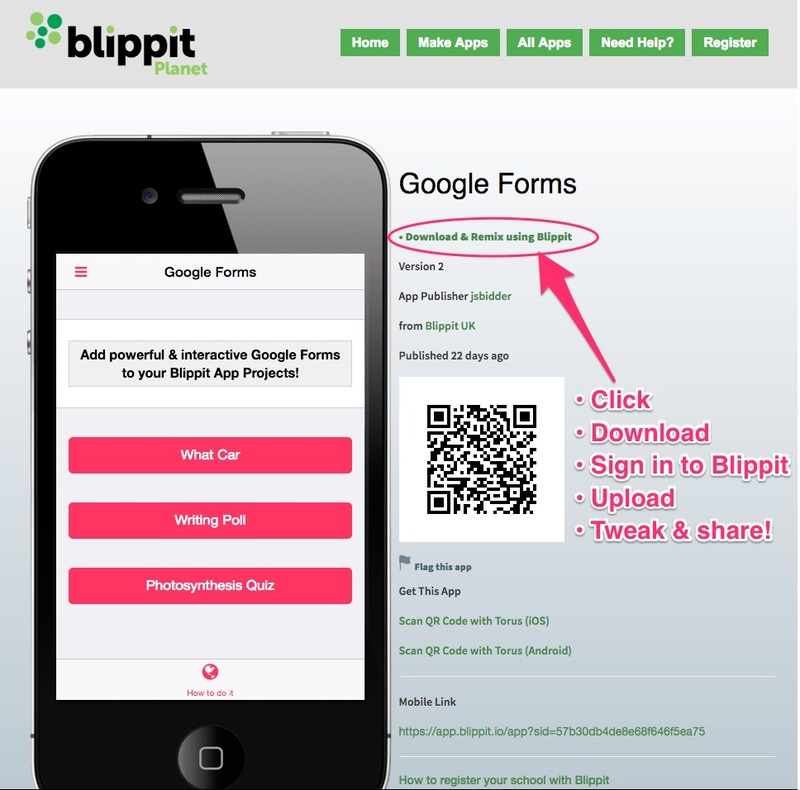 Have you taken a look at blippit.academy yet? Try our self-paced teacher CPD course for app making. Holgate Academy’s Year 7 Scheme for Blippit’s App Maker was in today’s collection of Google results! It’s a very thoroughly prepared few weeks of work that’d we recommend you take a look at if you’re looking for ideas certainly. If you’re involved in a project using any of our tools just email support@blippit.co.uk and we’ll feature you on the blog. A quick search of the new Planet Blippit for ‘revision’ brought up an interesting selection of apps made by students & teachers. Here they are & hats off to the publishers! 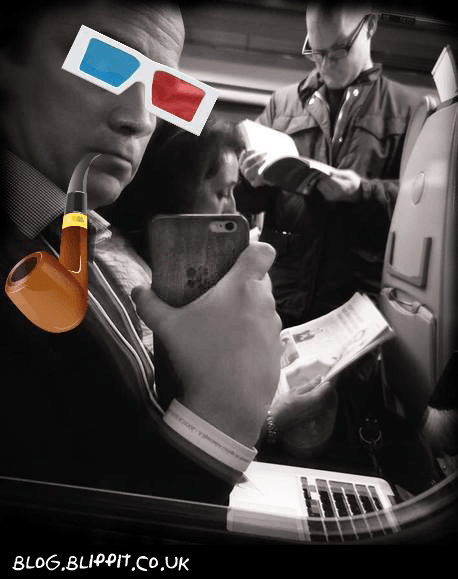 Yesterday I was on a train journey that seemed so dull it could have been in black and white. And that’s when I had an idea. I took a sneaky quick snap in the reflection of the train window, being sure not to arouse attention with a loud shutter sound effect or auto flash that would give the game away. I sent the photo up to the Cloud via 4G which then synced to my laptop. Once there I loaded up my beta version of the new app maker which is currently in closed testing with peeps from schools. One of the new features in the BETA comes under the heading of ‘funky’. It was never requested by any user ever but what the heck we built it anyway because we believe it’ll have a big impact for the better. Essentially we’ve taken the app maker and turned the Image Widget bit of it into a full blown image editor capable of quite magical things. Well, in the right hands anyway; not necessarily mine as you can see. We can’t wait to see what our users do with this 🙂 Choo choo! Coming out this month is a ready-to-go curriculum planning resource designed to save you time dealing with the demands of the new Computing Curriculum particularly at Year 6. 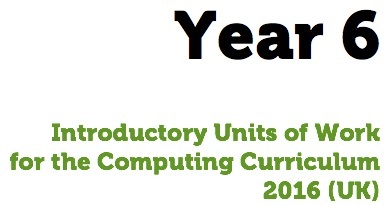 10 units of work mapped to the Computing and wider curriculum programmes of study plus. We fully expect and encourage people to tweak these units up and down to suit different year groups. We’re still working that bit out but all being well there’ll be a few different formats to suit however you like to digest this sort of resource. These app making plans were originally written and shared by Alex Young. 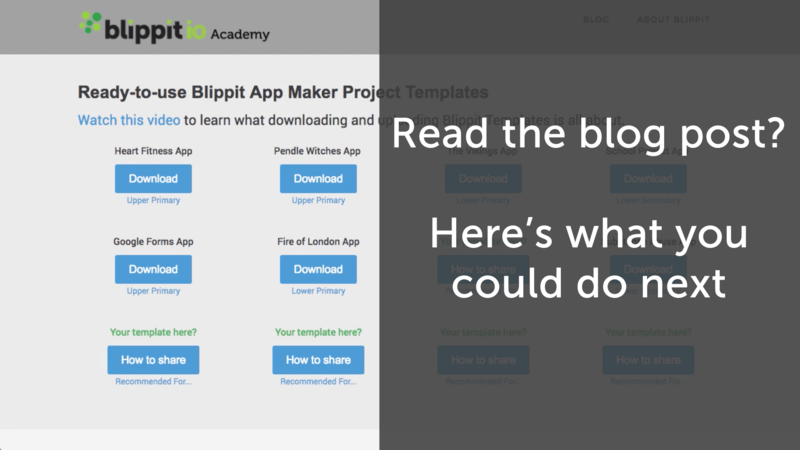 More templated app resources are available for download at Blippit Academy. We invite you to comment below or ping @justblippit on Twitter with a link to more resources. Thanks!